Please read the enclosed leaflet carefully before use. Directions for Use: For oral use. Swallow the tablet whole with water. Do not chew. 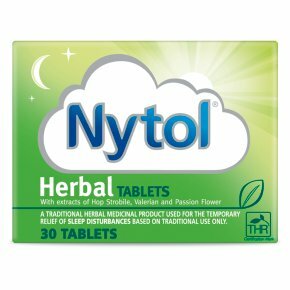 Dosage: Adults and the elderly: take 2 tablets 1 hour before bedtime. Not recommended for children under 18 years. Do not exceed the stated dose. WARNING<br>Do not take if you are:<br>Under 18 years of age<br>Pregnant or breast feeding<br>Allergic to any of the ingredients<br>Already taking a medicine for sleep or anxiety.<br><br>Avoid excessive alcoholic drink while taking this medicine. This medicine may make you feel drowsy. If affected, do not drive or operate machines. If symptoms worsen or persist consult your doctor, pharmacist or qualified healthcare practitioner.<br><br>Do not use these tablets after the expiry date stated on pack.<br>KEEP OUT OF THE REACH AND SIGHT OF CHILDREN.